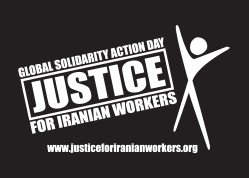 Four global union organisations representing over 170 million workers have called a worldwide action day on June 26 to demand justice for Iranian workers. Demonstrations will take place outside Iranian embassies and consulates to protest the ongoing denial of rights and arrests of trade unionists within the country. The ITUC (International Trade Union Confederation), EI (Education International), ITF (International Transport Workers’ Federation), IUF (International Union of Food, Agricultural, Hotel, Restaurant, Catering, Tobacco and Allied Workers’ Associations) are forming a coalition for the event, which is the latest move in an ongoing campaign to secure justice and trade union rights inside Iran. Amnesty International has backed this campaign. Conclusion of collective bargaining agreements between the independent unions and the relevant employers. This campaign, which has been ignored by the mainstream media, might be lost in the coverage of the popular opposition to the fraudulent June 12 election that returned Mahmoud Ahmadinejad to power. That would be a shame. Whether Ahmadinejad retains his grip on the presidency or not, Iran’s sordid record of human rights abuses will continue without fundamental changes. Find out what you can do at Justice for Iranian Workers.